In my last blog, I did discuss the Prozess Dimensionof the Target Operating Modell. Today, I want to reflect on the organizational impact of Cloud Computing Services to the re-definition of the required internal capabilities of an IT team. Can the cloud provide the resources faster than when hosted locally in your company? What do we give up? Is your organization willing to compromise? Are the organization, employees, IT staff, other interested parties willing to make the change without delay? 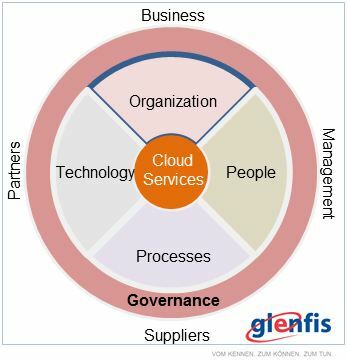 Governance culture and style: With Cloud Computing, the added values of an IT Organization depends on the performance of a legal entity outside of the perimeters of the own company. Respective Governance structures needs to be in place. Process Expertise in two dimensions: Sourcing process expertise (how to manage the entire sourcing lifecycle) and service management process expertise. Learning and Development: New or changed requirements toward organizational capabilities needs to be supported by training and coaching based on individual development plans. Are those capabilities around yet and where are the gaps to be addressed before the organization is ready to make the step? A maturity assessment (or a dedicated Cloud Readiness assessment) helps to identify the gaps in order to implement the respective measures. Best practice tools and methods are in available performing such an analysis – in one of my next blogs I will talk about such tools and methods. A lot of internal IT teams went through the Cloud Sourcing lifecycle already – most of them unprepared. They had to learn the lessons regarding required organizational capabilities the hard way – meaning, implementing the needed measures in an operational environment. It does not have to be this way if IT managers are clear about the impact of Cloud Computing to their teams way before Cloud Service commencement is starting. SOURCING INTERNATIONAL ist keine rein österreichische Unternehmung. Es ist ein Joint Venture, das aus Höllwarth Consulting und 42virtual entstanden ist. Diese beiden Unternehmen gibt es seit vielen Jahren, sie haben immer wieder hervorragend in großen Projekten zusammengearbeitet. Nimbusec schützt diese Webseite: Hacking passiert, und wird immer mehr zum Massenphänomen. Während Webserver und Netzwerke immer besser geschützt werden, geraten Webapplikationen wie Wordpress, Drupal, Joomla, Typo3 und Magento mehr und mehr ins Fadenkreuz von Hackern. Cyberattacken sind heute nur noch selten Zielgerichtet: Hacker schreiben Programme die Lücken in Webseiten automatisch nutzen um diese Anzugreifen. Durch die Verbreitung von Standardsoftware (CMS), bietet sich ein großer Markt für automatisierte Attacken. Das Ziel: Rufschädigung, Verbreitung von Virusen und Schadsoftware, und Erpressung durch verschlüsseln von Daten (Ransom).